For farmers approaching spring, many factors provide grounds for optimism. Meat companies paying $8 per kilogram for lambs, the beef schedule holding firm, the weakening currency suggesting returns could stay positive for a while longer, and interest rates remaining at all time lows. These are positive trends that should encourage anyone, particularly sheep and beef farmers. Although the dairy payout has wavered slightly, it is still high enough to keep dairy farmers positive that the current season will treat them well. In horticulture, the news is also rosy, with plenty of development in many horticulture regions, as growers and investors take advantage of buoyant demand from eager export markets. For sheep and beef, the excellent levels of confidence based on record returns are reflected in the demand for breeding and finishing farms in most regions. 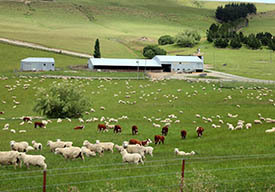 This sector is definitely a sellers’ market, and anyone who offers a sheep and beef farm for sale in the spring can expect a satisfactory result. While some caution remains around dairy property, this may well change during the spring, particularly in October and November. More farms are likely to come to the market during this period and, in general, there are buyers for these. One exception to that is the market for larger farms, where corporate purchasers are less evident. Since last year’s general election, with the new government making its stance on foreign ownership of land clear, an important class of buyer has been removed from the market, and any farm listed is attracting less attention than would have been the case before October 2017. In fact, this is affecting all areas of the rural property market. Overseas interest in investing in horticulture is as enthusiastic as it is in dairy. With the change of government, foreign buyers have also suspended their interest in the horticulture market, which is enabling local corporates and iwi to take a less pressured approach to these opportunities. This absence of overseas buyers has also resulted in a change in the perception of value, which is most apparent for dairy farms. As the spring market proceeds, vendors may need to adjust their expectations on what their property is worth. As noted, we expect an increase in the number of dairy properties offered to the market this spring. Those looking to sell these farms will need to pay careful attention to market commentary regarding value, or risk ending up without a sale. Once this value correction takes place, which it inevitably will during the coming months, the market for dairy property should regain momentum. Spring is the most important time in the rural property calendar. This spring is set to be a big one, with plenty of attractive listings across most regions likely to draw strong interest from a motivated gallery of buyers. This edition of Rural Property Pulse aims to provide useful information to anyone seeking to enter the market this spring, whether as a buyer or seller. If that is you, my colleagues at your local branch of PGG Wrightson Real Estate are standing by to hear from you, and to help you to achieve whatever objectives you have set in the market this year.